The future of teaching may well be online, despite the fact that face-to-face teaching has so many benefits. Online teaching poses many challenges to the teacher who is comfortable and used to teaching ‘live’ but these are challenges which can be easily surmounted, as there are multiple advantages to being an online teacher. Flexibility of schedules – early bird or night owl is not an issue! These are just a few of the advantages but there are also many challenges and possible pitfalls, which make it all the more important to be well prepared to take this important step into the 21st century! Working online assumes a very high level of comfort with educational technology as well as a sound grounding on the principles of teaching and learning. You can be just as good or as bad online and technology is not a solution, it’s just a tool that needs to be used wisely. Students’ attention cannot always be guaranteed but must be fought for every minute! The greatest pitfall is to believe that online teaching is the same as face-to-face teaching and that you can use exactly the same materials and techniques as with chalk and board. A drastic change in thinking is necessary as well as some training to be an online teacher. There are no perfect recipes or answers to everyone’s problems or challenges. A teacher who is paid 4 euros per hour but can get 12, 15 or 20 euros for an hour teaching from home will be at a great advantage, but in order to have a steady and healthy flow of income, teachers must learn to act as edupreneurs, not an easy step for everyone. Here is a good way to find out. Review this survey questionnaire and complete it. especially if you plan to follow our workshops at the International Publishers’ Exhibition in Thessaloniki on the last Saturday of August or in Athens on the first Saturday of September. All fields are required to help make this survey comprehensive – stay tuned for the results here and on my blog. 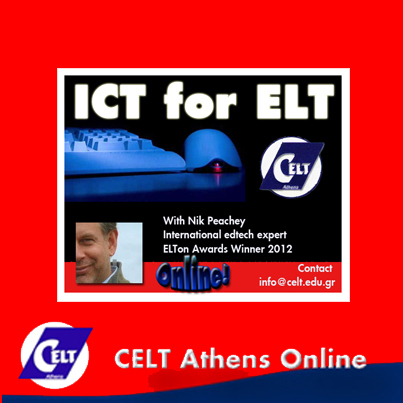 I am a frequent conference presenter and keynote speaker – some recent presentations can be viewed here I have presented at IATEFL International, TESOL France, Brazil TESOL, TESOL Greece as well as on numerous online Conferences and Events. In 2012 I was on the shortlist of nominations for an ELTons Award in Innovation in Teacher Resources along with my fellow moderators on #ELTchat, a weekly discussion on Twitter.